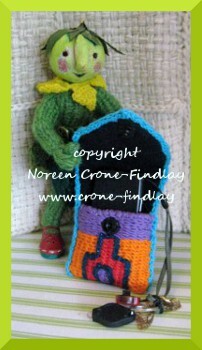 This is the second ‘Prelude Post’ for the Mirrix Loom Weave Along for the Soumak Pouch. My cellphone is one of the smaller, lower tech ones [4inches tall, 2 inches wide, 5/8 inch thick] if yours is larger, then you will want to upsize your pouch, if your pouch is going to be a cellphone pouch. The pouch can also be woven on any of the larger Mirrix looms as well- if you are using one of the smaller Mirrix looms, then warp up one pouch at a time. If you are using one of the larger looms, then you can warp and weave 2 pouches at the same time. 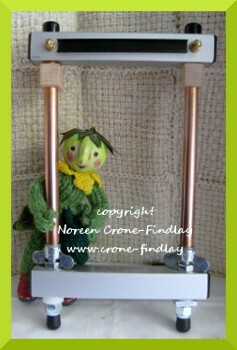 Even if you don’t have a Mirrix loom, please feel welcome to join in the Weave Along. 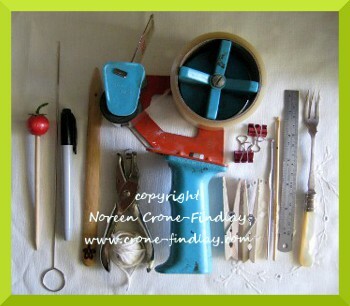 As long as you have a loom that you can get good tight tension on it, then you will be able to weave the pouches. 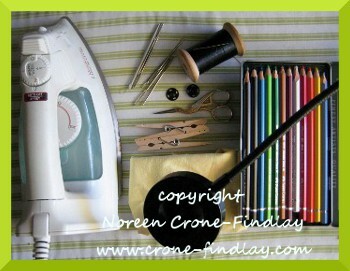 You will also need: A steam iron, a pressing cloth, a good source of light, pencil crayons or watercolors or some other way of coloring your preliminary pattern colorways, 2 clothespins, scissors, needle and thread for finishing, snap fastener and a swivel clip, you’ll also need paper for tracing out your patterns and trying out different color schemes. You’ll need rods for the top and lower edge of the weaving: 6 inch (15 cm) tent pegs or 6 inch (15 cm) lengths of steel or brass rods 1/8 inch in diameter (I bought a 36 inch long one at the hardware store and cut it to 6 inch lengths with a hacksaw); velcro straps (I bought mine from Lee Valley: Link; ‘S’ HOOKS: 25 “S” hooks, either 7/8 inch or 1 inch- opened or closed :[ I had a huge ‘AHA’ when I bought closed ‘S’ hooks…. 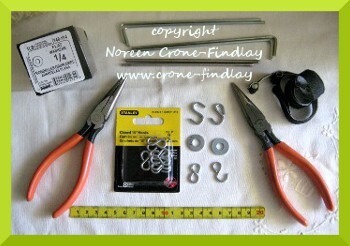 having one end closed is just GREAT… so if you buy closed ‘S’ hooks, open one end with pliers. If you buy open ‘S’ hooks, squeeze one of the ends closed. Having the closed end keeps the ‘S’ hooks on the rod. 🙂 ] ; 1/4 inch Washers: 54 in total; 1 or 2 pairs of pliers for adjusting the ‘S’ hooks; ruler and tape measure. 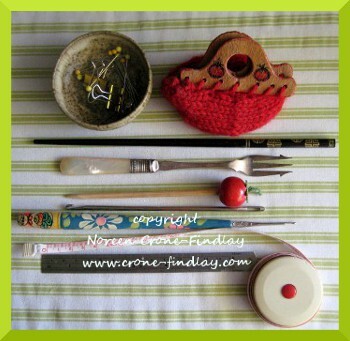 You will need at least 5 or 6 blunt tapestry or craft or darning needles. 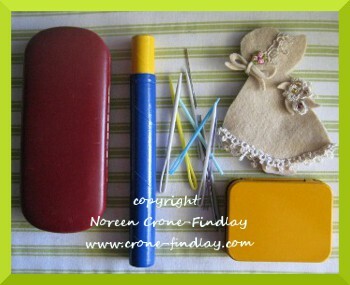 It’s handy to have a needlebook or tin, or cardboard tube or eyeglass case to store them in. 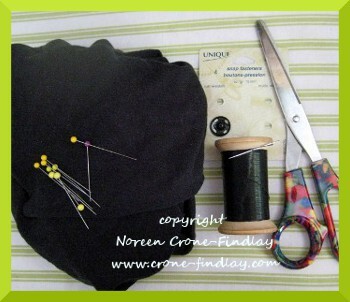 To line the pouch: Fabric (I upcycled one of my son’s abandoned t shirts for the lining of the first 4 bags), scissors, pins, needle and thread, snap fastener: I used the 15 mm size. – At least 5 or 6 blunt tapestry or craft or darning needles and a needlebook or tin, or cardboard tube or eyeglass case to store them in. 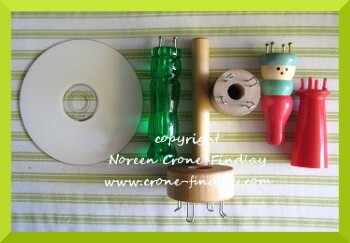 -any other embellishments, beads, buttons, charms or found objects that you wish to use. 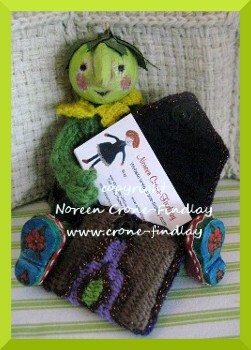 Noreen, If you are warping 2 pouches at the same time can one be cotton and one of them wool? I would use the same warp for both, as different warp fibers can react to tension in their own unique way. The weft can be wool or cotton or whatever you choose, but I would be cautious about having wool and cotton warps on at the same time. This is a good thing to experiment with, though, as I haven’t tried using different warps.